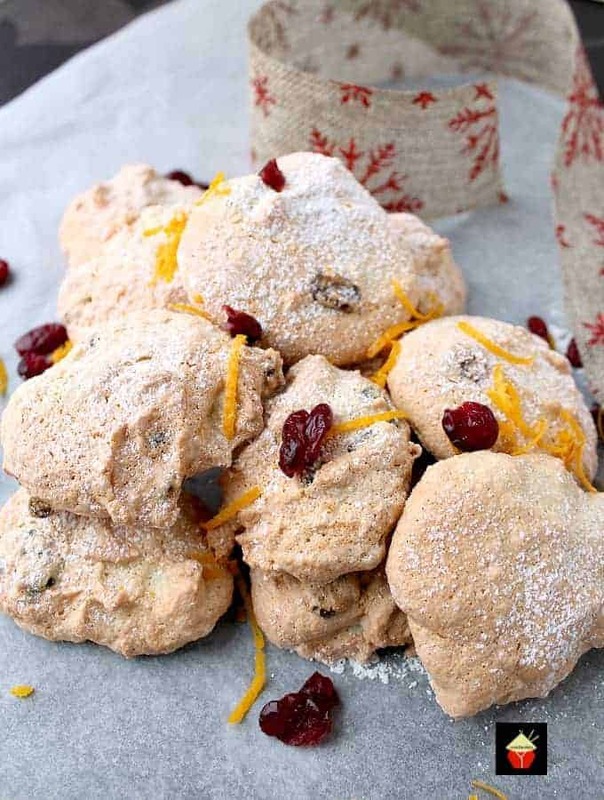 Amaretti Style Cranberry and Orange Almond Cookies. 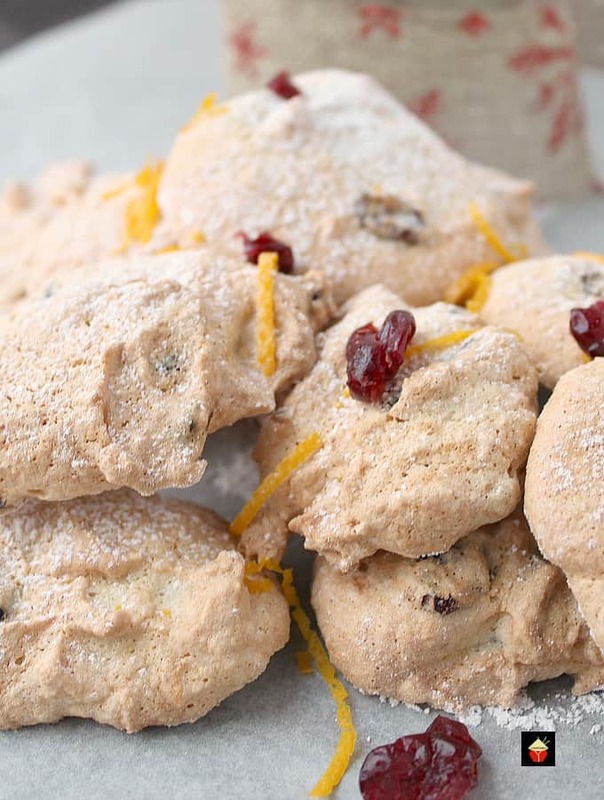 These amaretti-style cookies use minimal flour and have a light airy finish, fit to accompany desserts and drinks light as a feather and fat-free too! Oh my goodness! 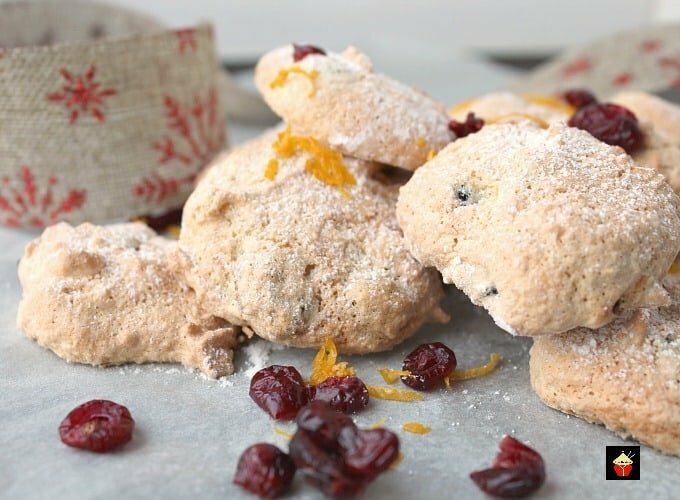 Amaretti Style Cranberry and Orange Almond Cookies. What can I say but oh oh oh! These little cookies are wonderful! They’re light, bursting with flavor and as fluffy as a feather! 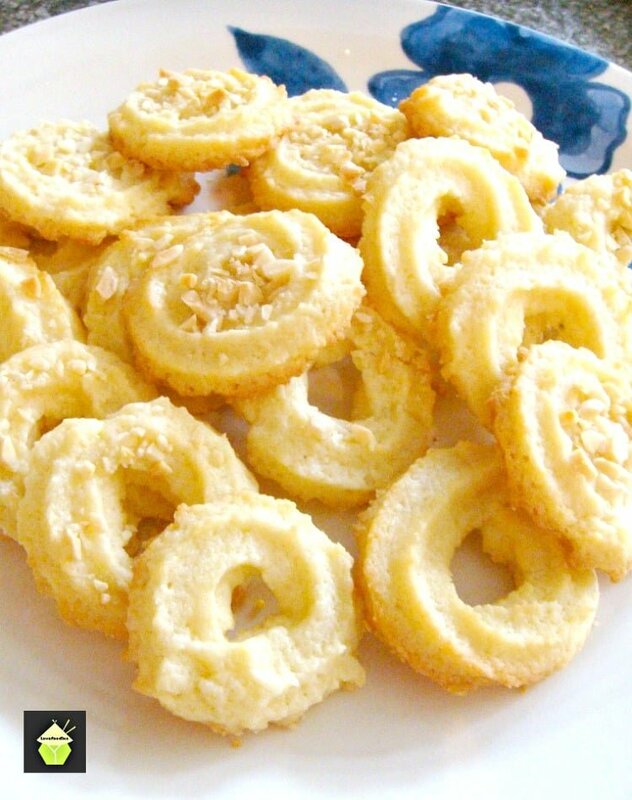 Ameretti cookies or biscuits are traditionally made up of egg whites and almonds, and often served with coffee or a dessert wine. They’re slightly crispy on the outside and chewy on the inside. 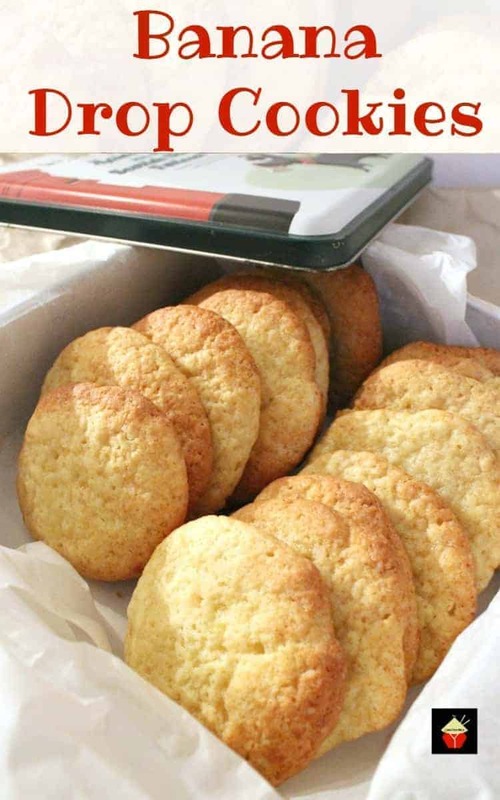 They’re incredibly popular over the Christmas holidays and you can usually buy them in large fancy tins and each cookie is individually wrapped inside the tin, making perfect for gifts. Here, we have our very own recipe which you can make and give as gifts and a fraction of the cost. Just find a nice tin or use a jar or some nice wrapping cellophane and make it festive! 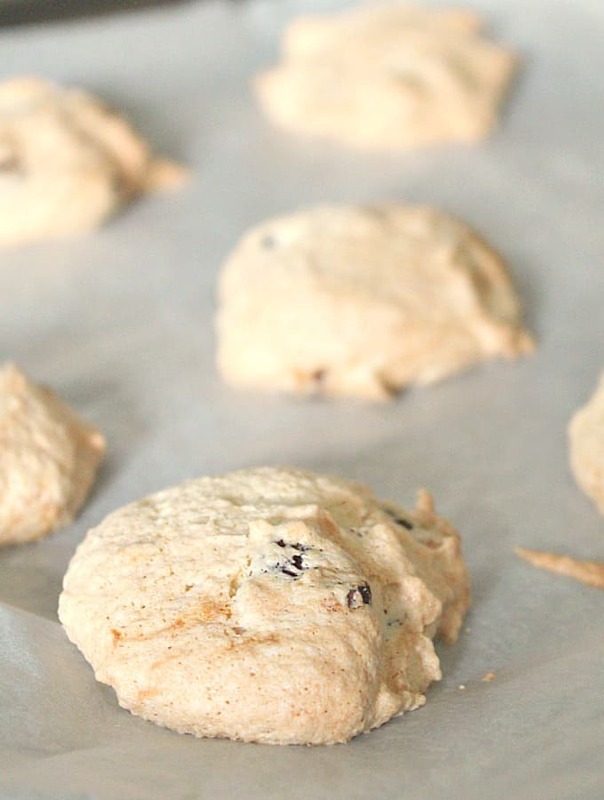 These cookies are incredibly easy to make and contain no butter or oil. 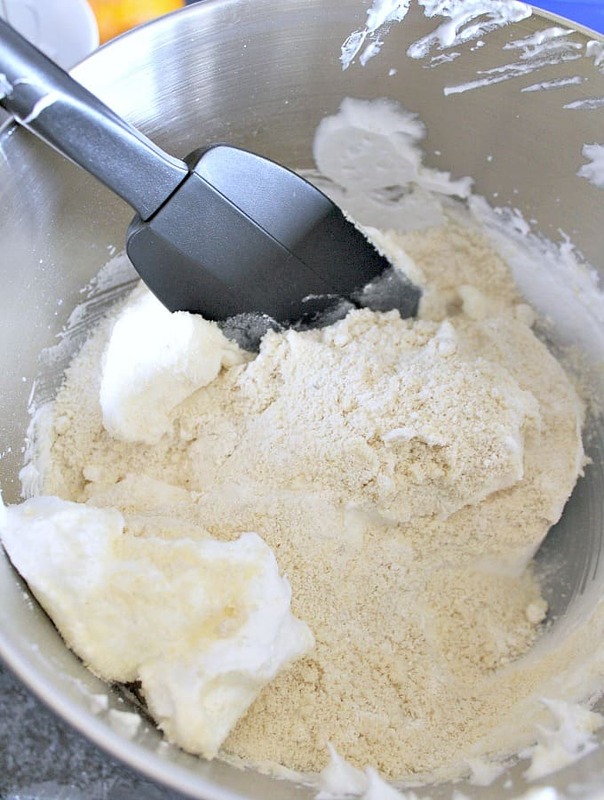 As far as flour goes, we’ve added just 2 tablespoons, the rest is made up of ground almonds, and to make them fluffy, well, that’s all down to the egg whites. 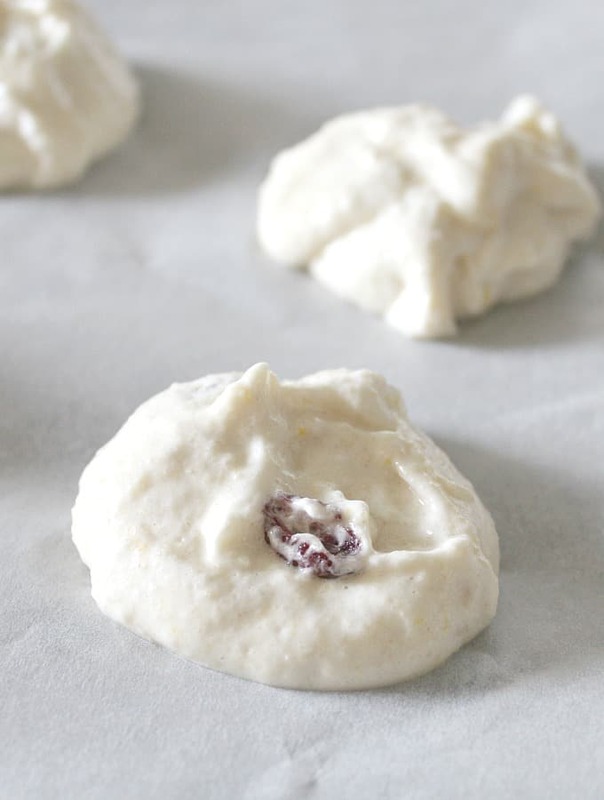 The texture is in between a meringue and a soft cookie, so imagine the lightness and no density that a meringue gives you. It’s funny when I was making these cookies last week, I had just pulled them from the oven and placed them on the cooling rack, when my neighbor called round with her daughter. Well, I hadn’t planned on their visit, but I could see the 9-year-old daughter looking longingly at these cookies cooling on the rack so I asked if she’d like to try one….. 6 cookies later, I think I’ll interpret that as a thumbs up! 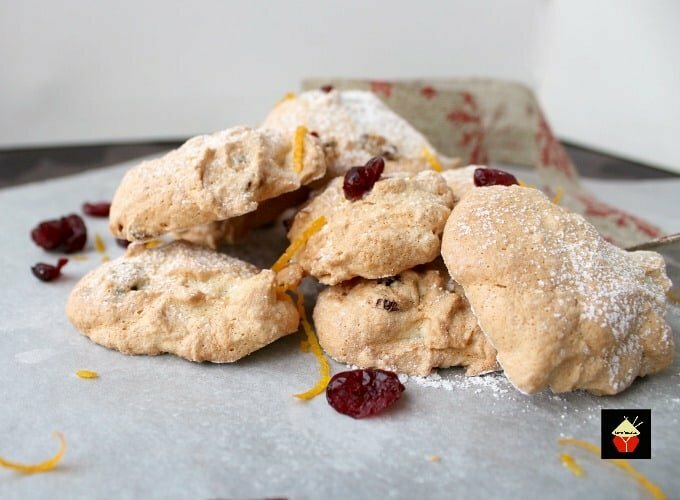 The addition of cranberries gives a nice texture to these cookies and of course, the flavor of cranberries which is slightly sharp, against the sweetness of the meringue and almond mixture makes for a nice contrast. 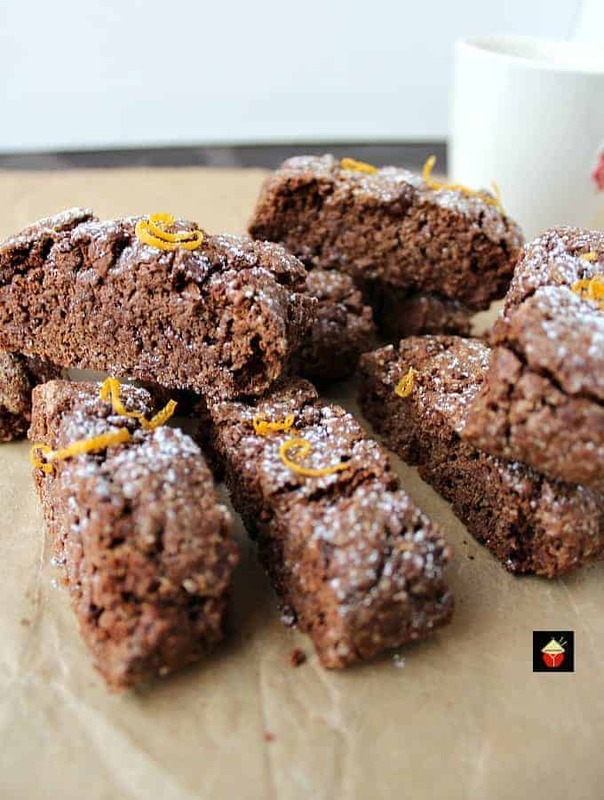 The added orange zest means you get a gentle hint of orange in every bite, whilst not overpowering. 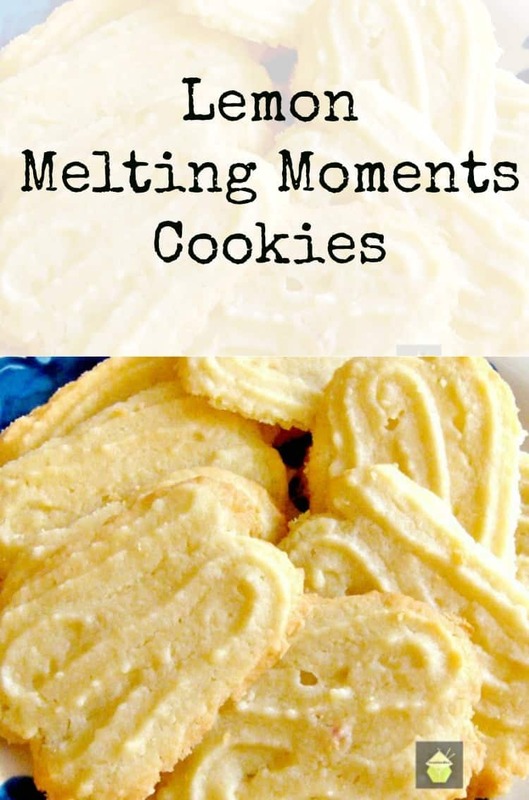 After baking, I popped a few in a paper bag and also some in an airtight container and checked them each day for texture and quality so I could let you know the best way to store these. 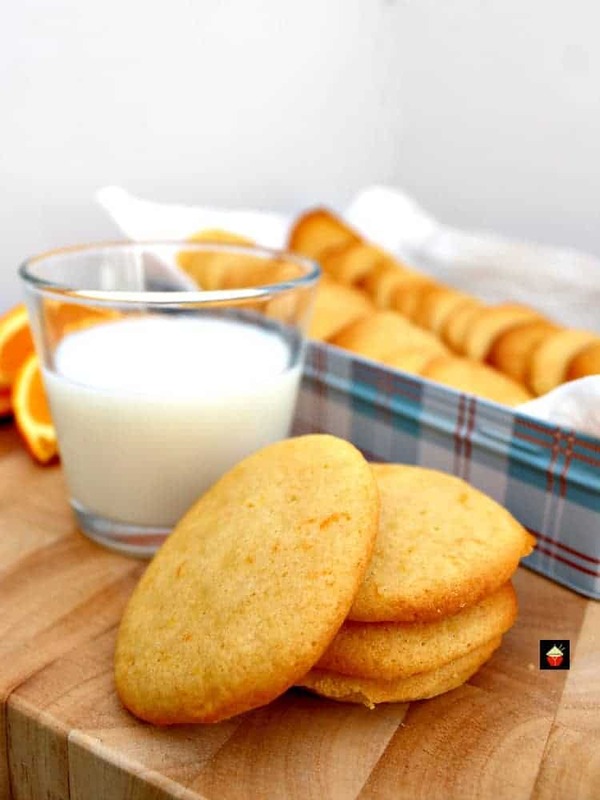 The cookies which I stored in a paper bag became crunchy and drier after the next day and the cookies kept in an airtight container stayed soft and chewy for up to 5 days. So if you like soft cookies, store in an airtight container. For an added crunch, pop them in a paper bag! Personally, I like them soft and fluffy. 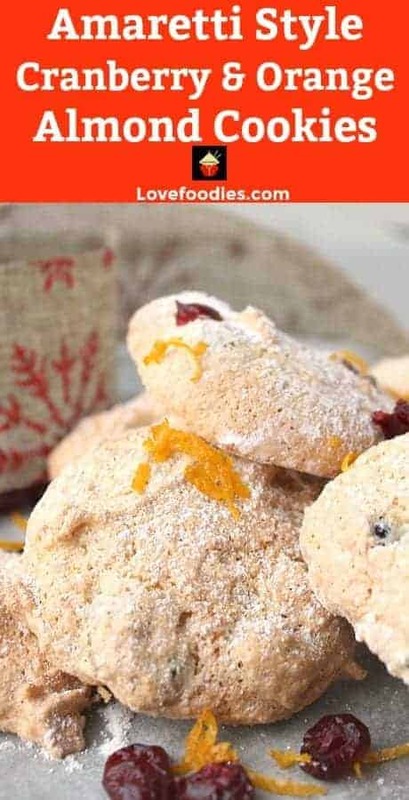 These amaretti style cranberry and orange almond cookies are also delicious served with a cup of coffee or tea and would make great gift packages for the Christmas holidays. Just pop some in a gift jar with a seal or wrap in gift wrap and give to friends and family. So pretty! We’ve got a great selection of other cookies here so please do take a look and save any recipes which take your fancy! 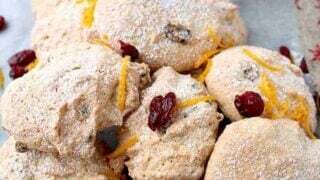 So let’s get straight to the recipe and see how we make these lovely little Amaretti Style Cranberry and Orange Almond Cookies. Please enjoy! 2. Line a baking tray with parchment paper or a silicone baking mat, weigh out and get all your ingredients together so you don’t lose time once your egg whites are whisked. 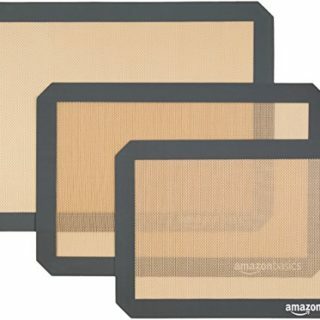 If you’re looking for a silicone sheet, here’s one we can recommend. 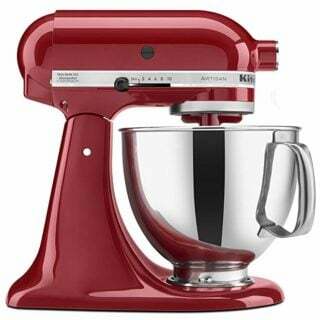 It means your cookies don’t stick and it’s really easy to clean. You can use this over and over again so no need to buy parchment paper anymore! There’s also a pattern on it to show you where to place your cookies so you don’t overcrowd the baking mat. 4. 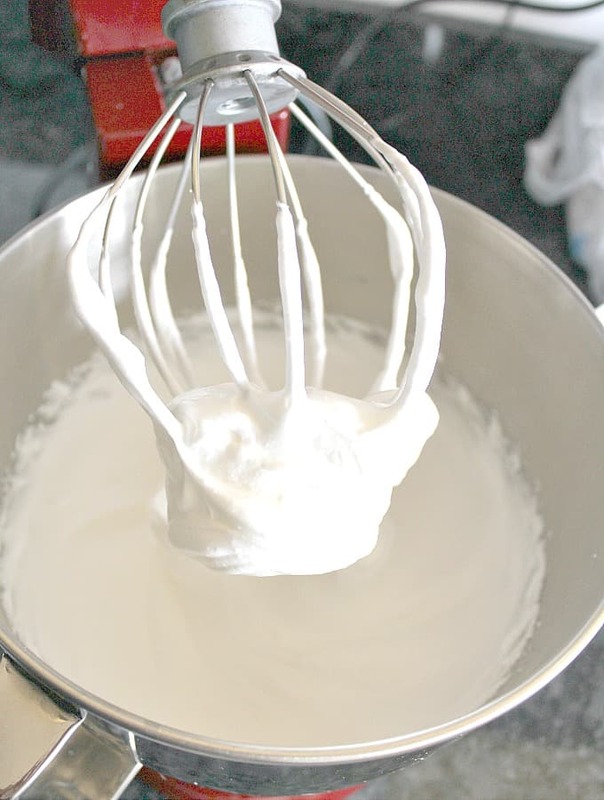 Gradually add the sugar whilst whisking until the whites are glossy and stiff. This will take a few minutes. 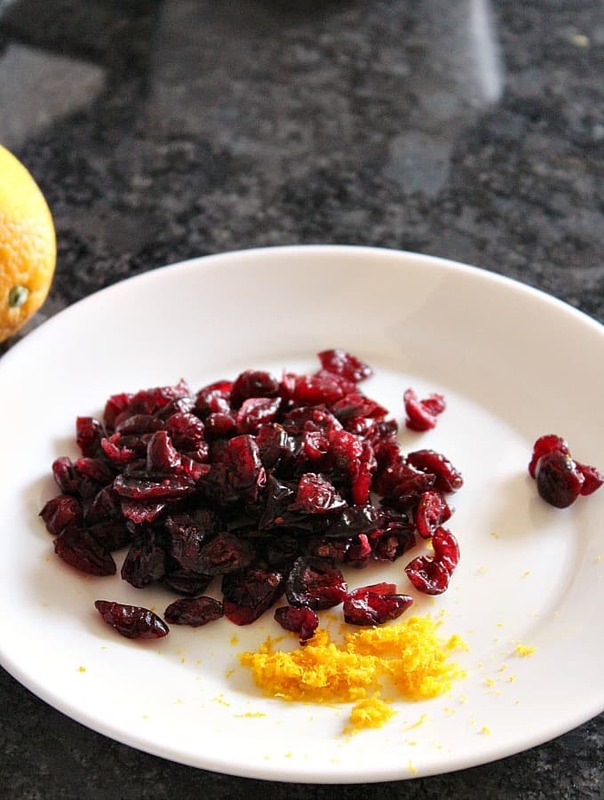 then add the orange zest and cranberries and gently fold into the mixture, taking care not to lose too much air. 6. 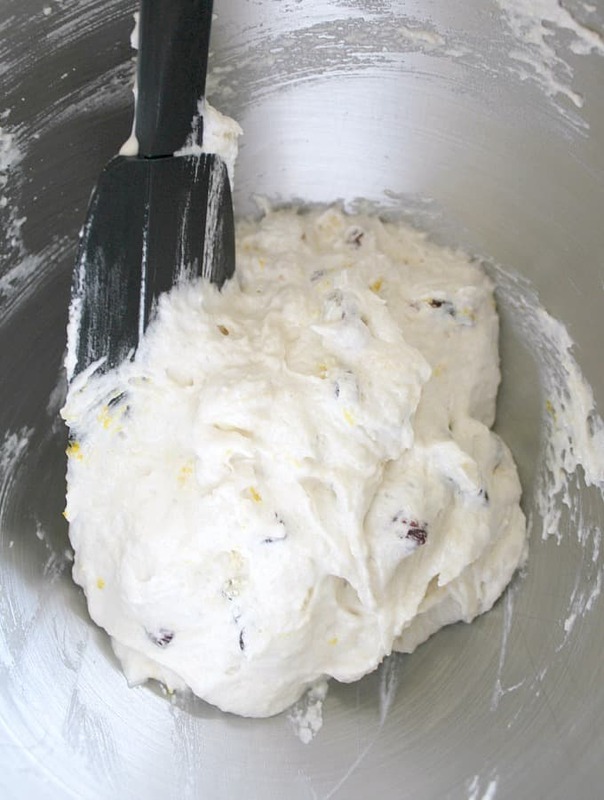 Use a tablespoon and spoon the mixture on to the baking tray. These cookies don’t spread too much so you can place them close together. 7. Bake for 20 minutes until slightly golden. Remove from the oven and place on a cooling rack to completely cool. 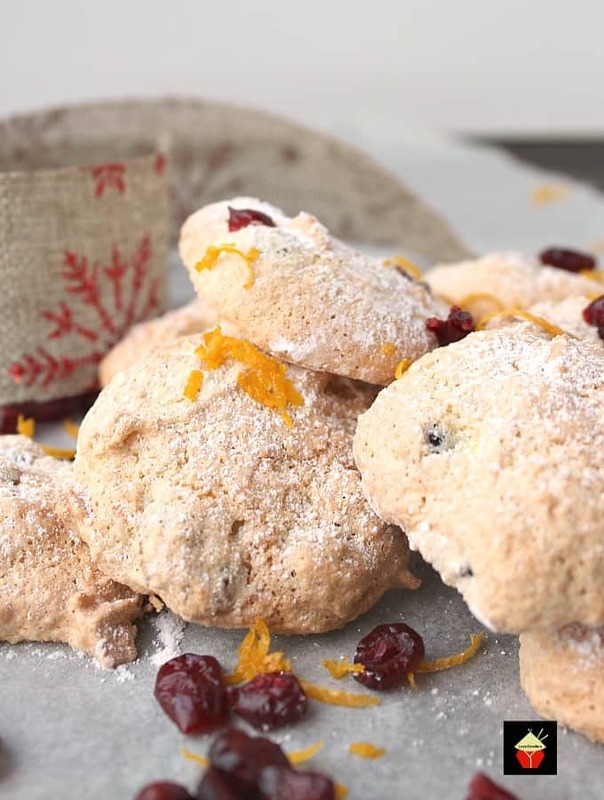 We’d love to hear from you and what you thought of our Amaretti Style Cranberry and Orange Almond Cookies recipe. Did you make any changes or add some other goodies? Let us know in the comments below. Thanks for reading and happy cooking! 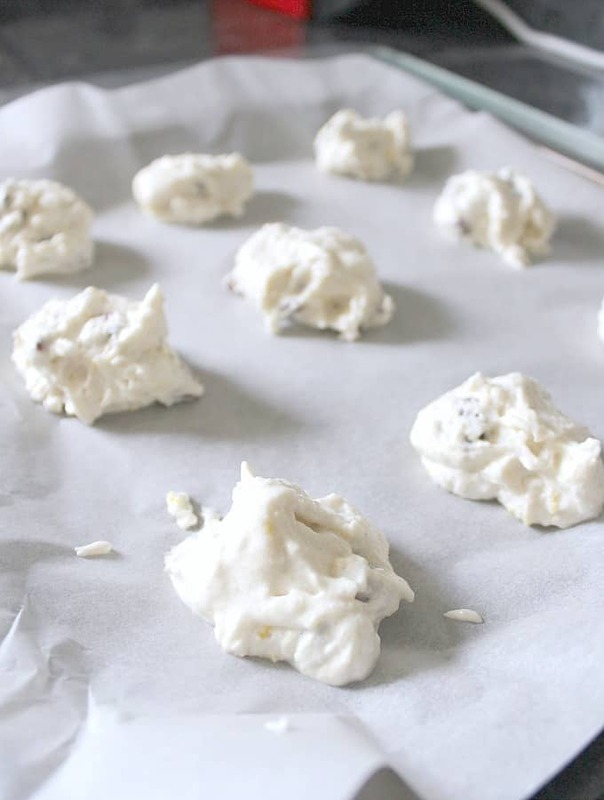 These cookies will keep in an airtight container for about one week, and if you leave them out, they will go hard so if you prefer a crunch, pop them in a paper bag! 2. Line a baking tray with parchment paper or a silicone baking mat, weigh out and get all your ingredients together so you don't lose time once your egg whites are whisked. 5. 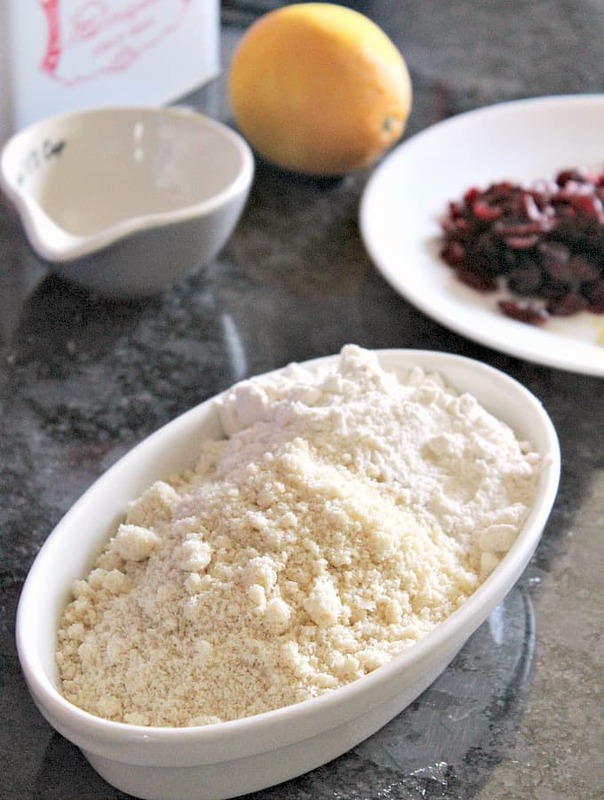 Add the flour, almonds, orange zest and cranberries and gently fold into the mixture, taking care not to lose too much air. 6. 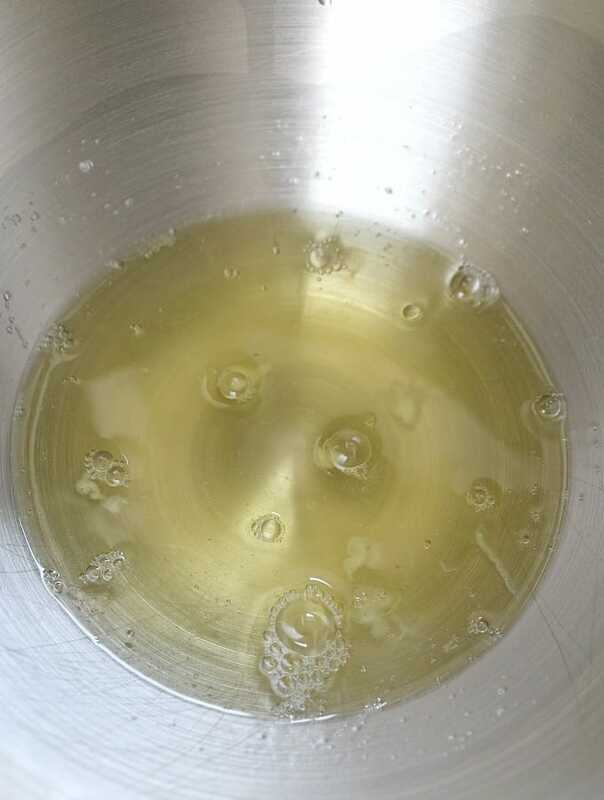 Use a tablespoon and spoon the mixture on to the baking tray. These cookies don't spread too much so you can place them close together. I didn’t have dried cranberries on hand so I used fresh and threw in 3 rings of dried pineapple chopped finely. After they cooled I dipped half the cookie in chocolate ganache. Wow! Will be making these again very soon!